Congressman Vic Snyder’s recent vote on what the Wall Street Journal has deemed “the worst bill ever.” While our national economy suffers with over 10% unemployment and people are losing jobs, Congressman Vic Snyder rushed through a government takeover of our health care that will cost even more jobs and hurt the economy. 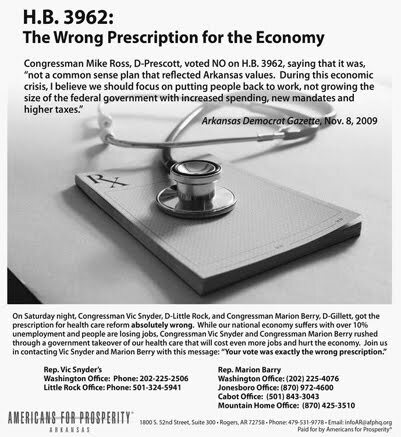 Please join us as we send a message to the Congressman that his vote was exactly the wrong prescription for Arkansas and America." Tags: AFP, Arkansas, bus tour, healthcare To share or post to your site, click on "Post Link". Please mention / link to the ARRA News Service. Thanks!